ESTABLISHED by a local mum to raise money for the school and to bring the community through its doors, the Redland Green car boot sale has become a popular event with Bristol folk ... so much so, that it brings in around £3,000 a year. Olivia Clark, a Redland resident and parent at RGS, thought up the idea for using the school's car park for boot sales in 2009. She drafted in the help of another local mum, Sarah Thomson, who had previously run a car boot sale at Bishop Road Primary School. 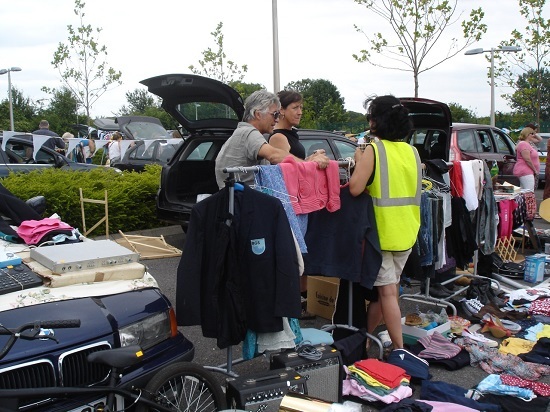 In the summer of 2010, the car boot sale took off, and both mums were heartened by the feedback from both the school and community. The pair have also received lots of help from other parents. Sarah said: "Olivia and I couldn't have done it without a strong team of willing and regular helpers." Around 50 pitches are on offer at the school, with booking in advance recommended. A big selling point for the event is that sellers are able to retreat indoors should the weather turn bad. At the event there is also a second-hand uniform stall, which stocks everything from blazers to sports socks at low prices. Bacon butties, pizza and flapjacks - donated by Dominic at The Bread Store in Gloucester Road - are also available to purchase from the on-site cafe. Olivia said: "The main thing the boot fairs always achieve, apart from a whopping sum of money for the school, is an event that brings people in from outside the school community and makes for a fun afternoon. "We love seeing people chatting away and enjoying a bacon buttie in the sunshine, while finding a bargain that they didn't know they were looking for. "The majority of stall holders and visitors are rarely parents of RGS students. People come from all over Bristol, and we have many regulars." Dates for the diary: April 18, May 16, June 20 and July 18, 1-4pm at Redland Court Road, BS6 7EH. Sellers £8 per pitch, book via forgscarbootsale@hotmail.com or 07968 493013. Admission 50p. Children go free.